Henry L. Dahners was born in Hastings, Minnesota on April 23, 1888 to Hubert and Rosella (Ley) Dahners. He received his education in St. Paul, Minnesota. In 1909 he left St. Paul to join a boyhood friend in Bowbells, ND and to go with him to Calgary, Alberta, Canada. While in Bowbells he met and later married a young school teacher by the name of Alice Kennedy on April 8, 1912. They were the parents to 3 children: Lucile, Gwen and Gregory. They lived in Calgary, Alberta, Canada for four years where he was hired to manage the Home Plate Cigar Store and keep the books for the professional baseball team whose headquarters were in the store. Henry and his wife Alice were given the opportunity to purchase the Edison Agency in Mandan from his father in law, C.G. Conyne who found that the phonograph music didn�t mix well with his watch repair business. They obtained the Columbia and Victor music companies and opened their music store in the fall of 1918 at the Nigey Hotel, later the McDonald Hotel. 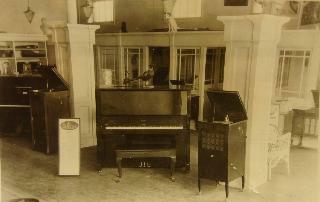 Their store sold phonographs, records, sheet music and player pianos, and later other instruments. Their business grew to where they needed to move into a larger building. It was then they moved into the Lewis and Clark Hotel. 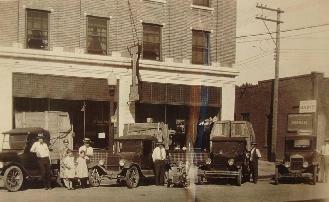 In 1928 they moved to their last location at 306 West Main Street. They added gifts and novelties which were sold in the basement. In 1934 they added women�s ready to wear and sold many wedding gowns. Later it became known as Dahners Music and Department Store. Mr. Dahners took an interest in music events, especially those of young people in the city schools. Mandan High School can thank him for getting the first paid band instructor in the school in 1946. Arnold Larson was paid $300 a year--$100 from the Elks Club, $100 from the American Legion Club and $100 from the Park Board. In 1970 he was the only music store to sell instruments to school children without having the students finance the purchase. Henry started the first radio station in Mandan in 1922. Mr. Bill Nordholm was the chief electrician and Henry did much of work to get the station operational. The station was named KGCU, with original studio in Dahners� store. Both Dahners and Walter Tostevin used to sing over KGCU. Lawrence Welk bought his instruments from Dahners Music Shop. First a banjo, then a saxophone, then the most popular-an accordion in 1936. For several years it was Saturday night band with Welk coming from Strasburg, North Dakota. Welk on the accordion, Walt Tostevin on piano, Bill Steinbruck on trombone, Rolland Lutz on trumpet and Ernie Wilkinson on drums, all from Mandan. They played for dances throughout the area. Another highlight to the Dahners period of influence was by Charles Lindberg of a man standing on the wing of his plane. The St. Paul Dispatch offered Lindberg�s appearance if 100 subscriptions to the newspaper could be sold. Henry Dahners did the job. After swooping down over the town, Lindbergh landed on the old half mile track on the south side of town, and then came to the store to visit with the attracted crowd. The same challenge came along again, Dahners did the job again. After this is when Lindberg took off on his famous flight to Paris, sending Henry a post card from there. Advertising in those days meant paying a $1000 to a famous star to come to Mandan, in one case, Will Rogers. Several hundred invitations for the show were sent to prospective customers. The old theatre was packed as he thrilled the audience with his gum chewing rope act while Baldwin pianos were being advertised. This type of function was done once a year. Henry L. Dahners was a well known, highly respected man. His years of dedicated service to Mandan and the surrounding area are commendable. He was a charter member of the Mandan Rotary Club and never missed a meeting in 50 years. He was also a member of both the Elks Club, which he joined in 1919, and Mandan Chamber of Commerce. Elected to the Mandan City Commission in 1934, he was in charge of the water department and supervised the building of the city water works plant during the Great Depression with the labor of WPA workers. The business was sold in May 1972 to Bill Eckroth after his death. Mr. Dahners passed away on Sunday, December 19, 1971 and is buried at the Mandan Union Cemetery.